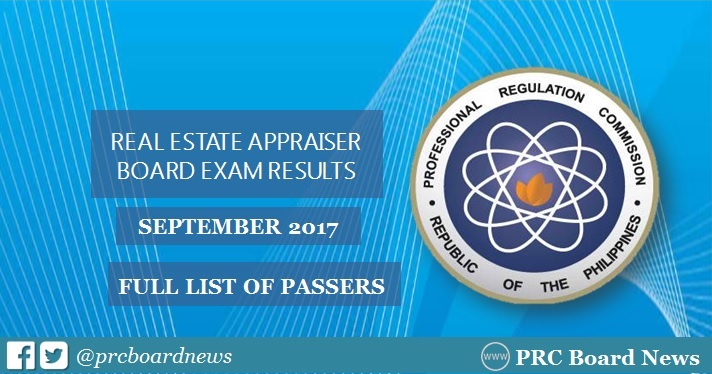 MANILA, Philippines - The Professional Regulation Commission (PRC) and the Board of Real Estate Service released results of September 2017 Real Estate Appraiser board exam on September 20 or in 3 working days after the last day of exam. The complete list of passers, top 10 (topnotchers), top performing schools and performance of schools are available on this page as announced online. UPDATE: As announced, 555 out of 1,501 passed the exams. PRC administered the Real Estate Appraiser board exam on Friday, September 15, in the cities of Manila Cagayan De Oro, Cebu, Davao, Iloilo, Legazpi, Lucena, Pagadian, Tacloban and Tuguegarao. Real Estate Appraiser board exam's verification of ratings (passers, non-passers and removal) can be done online. Visit PRC's "Verification of Rating" service and enter the required information to verify your identity. Note that this will be available in few working days after the release of results.